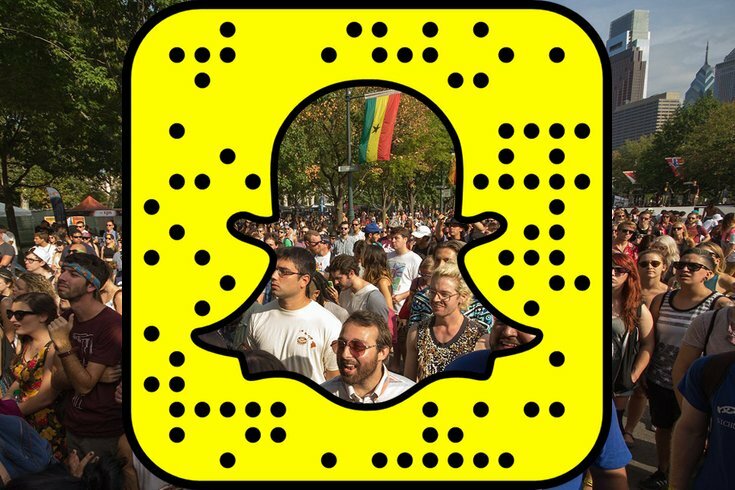 The Snapchat logo superimposed over an image of a crowd watching a concert during the 2015 Made in America festival on the Benjamin Franklin Parkway in Center City. Feeling weighed down by the oppressive humidity? Sporting your shorts, rompers and vintage basketball jerseys? You know what that means: It's summer concert season! And with the season comes the endless flow of social media posts showing what great fun you're having at the show. The ideal social media app for concerts, of course, is Snapchat — mainly because posts mercifully go away after 24 hours give your friends real-time updates and an inside look at the live music. It's as if we're there with you. • The Opener: Make sure to start things off with a grainy selfie of you and your friends. The angle should be about 45 degrees from eye level, should cut out at least half of one friend's face and include at least one unknowing bystander, who is just there to enjoy the music but is now being broadcast to a bunch of strangers. • Should I Identify the Artist Performing? : Optional. • Volume of Posts: You should post at least 25-30 short videos of the show. Anything less and you are a coward. It should be enough content that your friends will need to give their fingers a break while tapping through your whole story. You might be thinking, "Who would want to watch all that?" The answer is no one. But these are the friends you didn't invite to the concert, so you don't really like them that much anyway. Screw 'em. • Sing Along? : I shouldn't be able to hear the artist over you. • Style: Randomly split up your story with photos and videos. Try and get a continuous video of at least half of one song — just long enough so that it can't be enjoyed by the viewer. Clumsily zoom in on the artist performing, as if that will somehow provide a clearer picture. • Whoo! : Let out a "Whoo!" for us. You're at a concert, after all. • Electronic Music Concerts: Shake that friggin camera up and down as you dance, baby. I want my eyes to bleed. • Country Music Concerts: Just post about the tailgate, which is, "So much fun, even if you don't like country!" • Festivals: A warning – If you don't use the official festival Snapchat filter, they might kick you out. Hope this helps. Happy Snapping, concertgoers, and if you think I missed a tip, reach out.